Congratulations: to Mrs. Sighle Fitzgerald who has been elected by MACTE to be a recipient of the Wisdom of the Elders award. MACTE awards this honour to distinguished Montessorians who have made an immense contribution to the Montessori movement worldwide. Mrs. Fitzgerald’s amazing resume is at the end of this blog. We are all looking forward to our next P.E. workshop. This will be held on Saturday, November 23: 9 a.m. – 12 noon. Michelle will have copies of her book: Autism: A Montessori Approach – for sale at $12 per book. Please contact Debbie Couture at 416 640 1565 to register. We loved meeting Katherine Barber last Saturday when she presented a fascinating workshop: Why is the English Language so Wacky? See picture below. Katherine also presents amazing workshops on Ballet. CAMT Conference on Friday, November 1: We look forward to meeting new and old friends at this stimulating annual event and will include a selection of photos in next week’s blog. Mrs. Sighle Fitzgerald: Elected to MACTE Wisdom of the Elders. Sighle (pronounced Sheila) trained with Miss Margaret Homfray and Miss Phoebe Child, the co-founders of the St. Nicholas Montessori College in London, UK. Sighle was co-founder of the St. Nicholas College and School in Ireland in 1970, where she served as Principal of both the Montessori School and College from 1980 until her retirement in 1989, when she was appointed Life President of the St. Nicholas Montessori Society of Ireland. During the years 1984 – 1986 Sighle also served as Principal of the St. Nicholas Montessori Centre in London, UK. Sighle moved to Bermuda in 1990 and was Principal of Bermuda Montessori School and Montessori Academy from 1990 – 1992. She also presented an Early Childhood training program in Bermuda in those years. 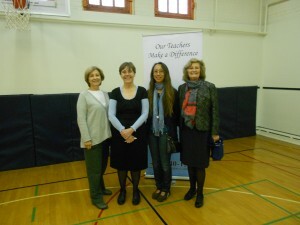 She then moved to Toronto where she was Director of Primary training from 1992 – 1997 at the Toronto Montessori Institute. New York, Vancouver, Cyprus, Paris, Sweden, South Africa, West Indies, Italy, Bahrain. Sighle is an inspirational Montessorian who has touched the lives of thousands of people in five continents. Her first language is Gaelic, and her interests include music, reading, theatre and travel. She is a mother, grandmother and now a great-grandmother.